Editor’s Note: The BOD has approved a program that will generate both interest in and understanding of otolaryngologists and what we do. We are targeting students curious about medicine and otolaryngology beginning in high school and extending into medical school. Our program will involve both community-based and academic type practices. This invited article shows one young physician’s successful involvement in localized programs to bring his personal enthusiasm for the specialty to medical students within his respective institutions. I have spent much of my early professional career as a resident and fellow trying to understand what motivates people’s interest. What does it mean to be interested in something, and where does interest come from? How does someone show interest, and how do we cultivate that interest? More specifically, how can we, as physicians and mentors, cultivate interest in students who represent our future generations of otolaryngologists? James G. Naples, MD (standing in back) helped formalize the Otolaryngology Interest Group at the University of Pennsylvania, where they have meetings centered around simulation of procedures commonly performed by otolaryngologists. My personal experiences have taught me that interest is the result of an environment and culture created by people who provide valuable experiences and opportunities. I often think about how this applies to the development of my interest in the field of otolaryngology. I remember the people I met when I was a medical student at the University of Connecticut, including Jeffrey D. Spiro, MD, and Kourosh Parham, MD, PhD, who fostered my interest. I remember the experiences of being in my first neck dissection and working on my first research experiment with them. Finally, I remember the opportunities they provided that allowed me to make professional progress. I am certain that my introduction to otolaryngology as a student is not unique, and I want to reciprocate these experiences for future generations of students. Now, more than ever, as our field overcomes the ups and downs of the previous residency match, it is important that our specialty focuses on promoting interest in otolaryngology, and I want to share my positive experiences in working with medical students to promote interest through Otolaryngology Interest Groups. I completed my residency training at the University of Connecticut, where the medical school is on the smaller side with currently about 100 medical students per class. With the small class sizes, otolaryngology was underrepresented as a field of interest because students did not get extensive exposure. This resulted in limited interactions with the people, limited experiences in how to manage otolaryngologic problems, and limited opportunities to join the specialty of otolaryngology. My idea on how to resolve this issue was simple: provide students with people, experiences, and opportunities. I believed that if all students have those three tools at their disposal, a culture could be developed that would help the students find a self-generated interest in the specialty. Ultimately, I felt that a self-generated interest would attract students who wanted to make positive contributions to our field. Todd E. Falcone, MD, who helped me promote the interest group. He always made himself available to students and constantly had students shadowing him in the clinic and OR. He was instrumental in promoting the group and recruiting other physicians to get involved, and he ultimately strengthened the culture of interest within the institution through his efforts. He, and others, even opened their homes to host meetings for students. Without the people willing to sacrifice their time for this initiative, the culture of interest would not exist, and I am grateful to all of the people who spent countless hours promoting this effort. With the people part of the equation in place, experience and opportunity were easy for interested students to find. 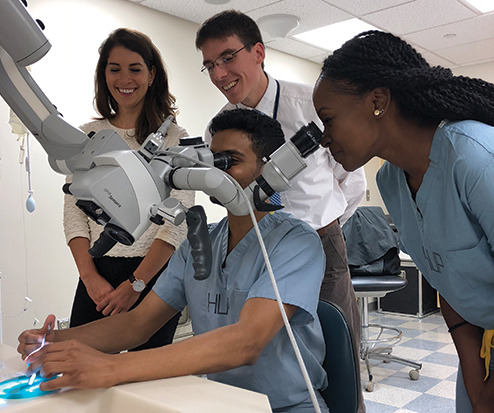 Once the students felt comfortable with the otolaryngologists, they had an easier time reaching out to explore various opportunities within the specialty. This was obvious during my residency, as the number of students shadowing in the clinic and OR increased as the Otolaryngology Interest Group matured. Most of the students were self-directed learners, so they knew what experiences they wanted to explore and what opportunities they wanted. I became a student liaison. I would inquire about their goals, letting their interests guide them as they explored our specialty, and provide them with all their options. As they gained experience, their interest often grew, and their involvement increased. The process was very organic. It was not based on expectations. There were no evaluations or judging. It was a time for the students to learn and explore. We simply created a comfortable environment for the students with people who fostered their enthusiasm. It was gratifying to get follow-up from the students who would see me in the hospital and tell me about their first experience with an otolaryngologist. Whether it was seeing a flexible laryngoscopy, learning a new pathology, or watching a new surgery, the experiences they shared with me made the time I spent worthwhile. It made me recall all the positive experiences I had when I was in their position. As my residency ended, I went on to pursue a neurotology fellowship at the University of Pennsylvania, where I am currently. They had an existing Otolaryngology Interest Group, and I was excited to continue my involvement when I arrived. The interest group was larger because the school was larger, and there was a more established culture of interest. Similar to my residency experience, the people part of the equation was easily accessible and willing to get involved in developing a positive culture around the interest group. My fellowship director, Michael J. Ruckenstein, MD, MSC, shared my passion for working with medical students and encouraged me to get involved. Together, with many other faculty, we have formalized the Otolaryngology Interest Group at Penn. We have had meetings centered around simulation of procedures commonly performed by otolaryngologists, and we have upcoming meetings planned to discuss research opportunities for students. Students often approach me to tell me how exciting it was when they learned to place an ear tube during the simulation meeting. Since formalizing the interest group, countless students have already become involved in research opportunities and positively contributed to our department. It is easy to tell the students are motivated by self-interest, because they contribute despite not being required to get involved. We simply keep the door open, and they get involved on their own. In working with these students on research, I have learned to appreciate the questions they ask and the different perspective they bring to our specialty. They do not think about problems the way I do and they are not supposed to. Through this interest group, I have learned a lot from the students, and that is largely why I believe in the power of self-generated interest. It strengthens the culture that these interest groups should promote. As I move toward the end of my fellowship, I often consider what will allow these otolaryngology interest groups to remain active. At both institutions, the need for both senior and junior leadership was reinforced so that the experience will continue as it comes time for current members to graduate. Similarly, the need to maintain dedicated physicians as the foundation upon which the culture of interest is built cannot be overstated. This foundation opens the door to continued positive experiences and opportunities. While I will likely never fully understand the philosophical question of what interest is, I am beginning to understand some of the necessary parts. As long as we have the people who practice in the field to provide experiences and opportunities for students, interest in our specialty will continue to grow. I am fortunate to play a small part in this, and I look forward to continuing my contribution for future generations of otolaryngologists.